Ships pass by mobile seawalls placed into the sea to protect the Venice from the high tide on October 12, 2013. Venice (AFP) – Flood-prone Venice on Saturday carried out the first test of its 5.4 billion euro ($7.3 billion) barrier system known as “Moses”, designed to protect the Renaissance city from rising sea levels. The ambitious engineering project involves installing 78 mobile barriers divided into four sections at the three inlets to the Venice lagoon, with the largest inlet divided in half by an artificial island. 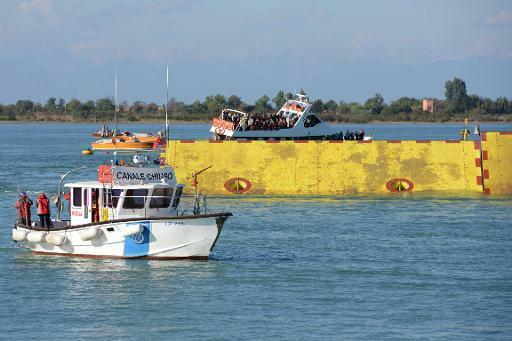 Fifty companies have been involved in the massive project overseen by the Venezia Nuova consortium, which has been dogged by delays, environmental concerns and scandal. On Saturday, dozens of officials including Italian Transport Minister Maurizio Lupi were on hand for the first test of the system. They looked on as four floating barriers were raised at the lagoon’s eastern Lido inlet. “This is a very important and emotional moment,” Venice Mayor Giorgio Orsoni told AFP. Orsoni added that Venice was “not an amusement park, it is a living city.. and this is a demonstration”. The locks will be activated when the water is 1.10 metres (3.6 feet) above normal levels, said Hermes Redi, Venezia Nuova’s director general. Venice is threatened several times a year by the “acqua alta”, when the high tide in the Adriatic climbs by about a metre, leading to flooding of the city’s most celebrated sites, including St Mark’s Square. The city’s vulnerability to rising water levels has worsened dramatically over the years. During the 20th century, Venice sank by 23 centimetres. The 78 box-shaped barriers will be inserted into immense tanks on the sea floor. When high waters threaten the city, pressurised air will be pumped into the barriers, raising them up on hinges to block the tidal flow. Once the danger has passed, the air will be expelled and the barriers will fill with water and sink back to the sea floor. Construction began in 2003, and the system that was initially scheduled to go into operation in 2014 is not expected to be up and running until 2017. The project has also raised concerns over graft. Under a major investigation into alleged corruption in contracts to build Moses, 14 people were placed under house arrest in July. Among those detained was Giovanni Mazzacurati, who had stepped down as Nuova Venezia’s head in June, along with several members of the consortium and contractors. Mazzacurati is suspected of “distorting” public tenders for the construction and favouring particular companies.